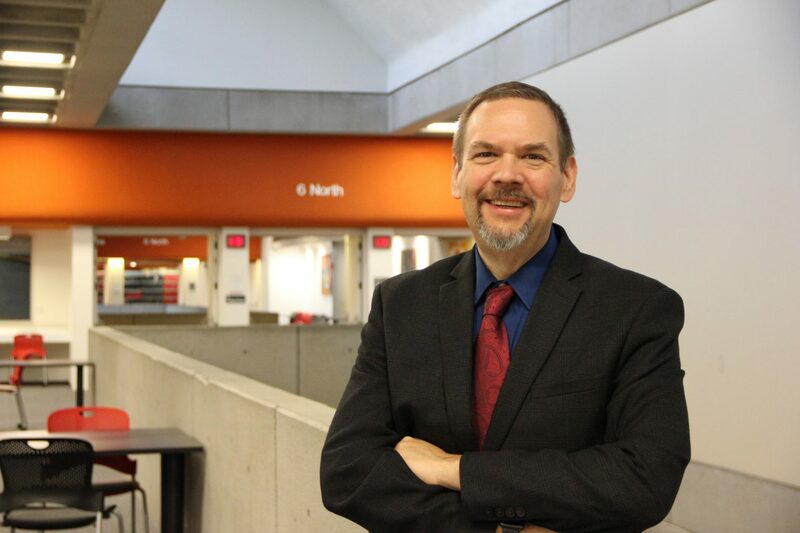 In August 2018, Brad Warren joined UC Libraries as the associate dean of library services. Below is an interview with Brad about his professional background, immediate goals for the new position, and his early impressions of UC Libraries, as well as how he and his family are having fun exploring Cincinnati. Brad can be reached via email at brad.warren@uc.edu. Please tell us your professional background. I have worked in academic libraries for 24 years and as a librarian for nearly 20 years. Before coming to UC, I was the director of access services at Yale University Library, working in that position for a little over nine years. I was the public relations and grants librarian for five years at UNC Charlotte and began my professional career at NC State University Libraries as a fellow and assistant department head for access services before that. Although all of my positions have been in some sort of public services role, I have also been involved in various other aspects of the library’s work. I have been responsible for major renovation projects, developed creative and innovative programs and services, consulted on projects involving collections, special collections and preservation, along with serving in a variety of capacities with the Association of College and Research Libraries (ACRL) and the Ivy Plus Libraries over the past 10 years. What will your role be in UC Libraries and will/how that expand outside the university? I am the associate dean of library services, responsible for the planning and development of existing and new services to ensure that UC Libraries is highly engaged with students, faculty and users in the rapidly changing academic environment. I am also interested in forming and developing relationships with our partners in the community, such as the Public Library of Cincinnati and Hamilton County, at the statewide level with OhioLINK, and more broadly nationally and internationally through the ACRL and the Association of Research Libraries. As the teaching, research and scholarship needs of our community continue to evolve and develop on a more national and global scale, UC Libraries must be responsive to those needs. We must anticipate areas in which our users will need to engage with us, and ensure that we have built a solid foundation with our partners, both locally and more broadly, to ensure that the UC community can be successful in its academic and research endeavors. Which libraries are part of your portfolio? How are they similar? How do they differ? I have several libraries in my portfolio. They include the Walter C. Langsam Library, the College of Education, Criminal Justice and Human Services Library, the Gorno Memorial (CCM) Library, the John Miller Burnam Classics Library and the Robert A. Deshon and Karl J. Schlachter Library for Design, Architecture, Art and Planning (DAAP). The most obvious differences between each library are the college and departments that they serve and the unique collections and services that each must provide in order to be relevant to their unique users. However, while each of these libraries differ in size, clientele, collection focus, facilities and staffing, they are similar in that they must continue to evaluate, reassess and plan for how best to meet the needs of all UC users, regardless of discipline. They all play a vital role in UC Libraries meeting our mission to “empower discovery, stimulate learning and inspire the creation of knowledge by connecting students, faculty, researchers and scholars to dynamic data, information and resources.” As the campus and scholarship in general becomes more transdisciplinary, traditional boundaries between those disciplines continues to get blurry. I am dedicated to finding that with which we all hold in common while maintaining the distinctive differences and needs that each location needs in order to best serve its primary clientele. Why were you interested in working at the University of Cincinnati Libraries? There are a few reasons why I was attracted to working at the University of Cincinnati Libraries. I am a native Midwesterner from Indiana, and while I was looking for positions with similar responsibilities and portfolios, I was interested in returning to the Midwest for a variety of familial reasons. I also have ties to UC in that my uncle is a professor emeritus from DAAP along with a cousin currently working in CCM. This made Cincinnati a natural place to look. During my interview, I was deeply impressed by several aspects of UC Libraries. The Libraries is in a period of exciting transformation as we embark on new endeavors such as the Digital Scholarship Center and the University of Cincinnati Press, while we remain committed to maintaining excellent collections and innovative services. Langsam is a vibrant library that is almost unrecognizable from what it was just a few years ago! The Libraries have come a long way under Dean Wang’s leadership, and I was attracted to the possibilities of working in such an innovative and entrepreneurial environment with the added excitement and challenge of how to position, feature and excel in the areas of arts and humanities libraries and librarianship. From your experience, what are some of the major trends in academic libraries, especially in regards to how students, faculty and researchers interact and use the library? Academic libraries are under a state of continual change with the added pressure of users expecting near instant access to information, goods and services. Libraries must operate under a constant state of self-reflection, innovation and engagement with the academic community to ensure that its services, collections and facilities are dynamic, relevant and responsive to the needs of its constituents. UC Libraries is doing a fantastic job of ensuring our success if I am unable to predict what the library will look like in five years. It is through a constant state of change, assessment and steady progress towards the principles of our mission and vision in which we can continue to excel at what we do. Students, faculty and researchers will continue to work with the library through our collections, services, research support, programming and engagement – it will just be different from what it is now. In a related question, how is UC Libraries reacting to these trends? UC Libraries has made some key strategic decisions to help move into the future of library services and engagement, while also making an investment in the day-to-day operational needs of the library. It is a complex and difficult undertaking to ensure that we continue to meet the core needs of users while determining what those needs will be in the future and finding a way to meet those needs without an increase in resources. I feel confident that we will be successful in continuing to react and hopefully anticipate these trends through a combination of a commitment to our existing libraries and services and through successful entrepreneurial endeavors such as the Digital Scholarship Center and Research Data Services. As these early experiments transition into our suite of core services, I am confident that the strong relationships our faculty and staff have built across UC will enable us to incorporate these initiatives into our day-to-day world while continuing to experiment and develop the services, collections and academic engagement of the future. You have been here six months, while that is still a short time, what are emerging as your top priorities in this position in the months to come? Anything surprising that you’ve learned so far? One thing that I have found very surprising in my time with UC Libraries is the high level of engagement and strong relationships library faculty and staff have developed with the teaching faculty and university administration. I have worked in five different universities and none have had the same strong level of partnership and outstanding relationships that match what I have seen at UC Libraries. I believe that we are very lucky to have this amazing foundation to build upon, and I know that the Libraries and UC will be able to partner in ways that enhance the mission of the university in ways that most other universities cannot even consider. It is a surprise to see this from my previous experience, but one in which I am extraordinarily grateful and hope to build upon. Any early impressions of Cincinnati, UC or the Libraries you wish to share? I have been impressed with how strong the link is between the university and the Cincinnati metropolitan area. In the short time that I have lived here, just about every person I interact with around town either graduated from UC, has a child that goes to UC or works for some part of UC. There is a great pride in the city, its cultural institutions and the university that is striking, and I believe the tenants of President Pinto’s ‘Next Lives Here’ strategic direction are an astute and relevant set of principles that have already been received well by the university and city. UC Libraries is an essential part of the university and the greater Cincinnati community, and I look forward to doing all that I can in my role to help all of us succeed as best as we can in such a vibrant and connected environment. Cincinnati knows its beer, chili, culture and pastries! I suppose this isn’t a surprise considering its Germanic roots. I continue to play violin with the Cincinnati Community Orchestra, which has been a fantastic experience. I have also become a huge fan of the Little Miami Bike trail, and have traveled the entire length from Newtown to Xenia, albeit not in one day! We have made it a point to try to experience as much as we can around the area with the family, and have enjoyed the Zoo, Museum Center, Art Museum, Contemporary Arts Center, the Purple People Bridge, finding fossils in Sharonville, visiting Fort Ancient, exploring Caesar Creek State Park and are just getting started on the Butler County Donut Trail. I know that we have only scratched the surface and look forward to experiencing and doing more in the Cincinnati area in the years to come.